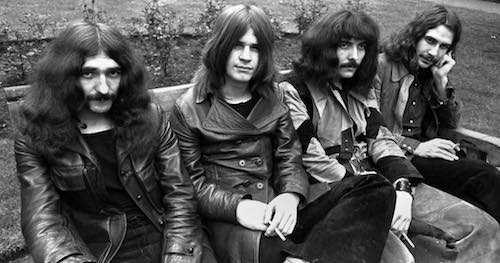 Steppenwolf may lay claim to the first use of the phrase in a song, but a strong case can be made that Black Sabbath was the undisputed progenitor of “heavy metal thunder.” Every defining characteristic of the Birmingham, England, band’s self-titled debut would become a hallmark of the oft-maligned genre. 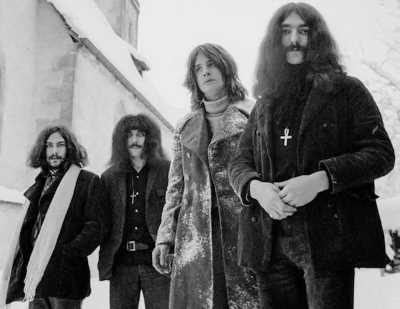 And while critics often gave Black Sabbath short shrift during the band’s initial run, hindsight has proven that the group’s body of work between 1970 and 1978 is as impressive a collection of albums as one is likely to find in rock history. And it all started with 1970’s Black Sabbath. Though the band formerly known as Earth wouldn’t display music in the way of imagination in the titling department—both the album and its opening track share a title—the music is startlingly original. Opening with a sound effects collage straight out of a “Hammer Horror” film—torrential rain, resounding thunder, ominous tolling of bells—“Black Sabbath” lets the sound effects continue for more than 30 seconds before unleashing a molten riff. That three-note riff is built upon the so-called “Devil’s interval” (also known as the flatted fifth, or more dramatically, diabolus in musica), a musical device dating back to the days of Wagner and Beethoven. Like those composers, Black Sabbath guitarist Tony Iommi uses the interval to connote doom and evil. Taking the heavily power-chorded melody at a glacial pace, the band leaves large spaces between the notes, giving each the chance to ring out for maximal effect. Drummer Bill Ward and bassist Geezer Butler play in tight lockstep; even though the intensity is high from the opening note, the three musicians manage to wring an increasing level of tension out of the repeated motif. Ward inserts random-sounding yet tightly controlled percussion splashes into the spaces between those doomy notes. A minute or so in, the band quiets down, creating space for vocalist Ozzy Osbourne to enter. From the opening couplet (“What is this that stands before me?/Figure in black which points at me”) it’s clear that the dark tones that introduce the album will be carried through in its lyrical matter. With the band reducing its attack to the most minimalist series of notes, and taps on the drum kit, the focus is placed squarely on Ozzy’s vocal; the spaces between the vocal phrases serve to heighten the tension: What comes next? After an answer of sorts, the musicians resume their louder, heavier approach, with a portentous iron bell chiming along in time. The entire cycle is repeated. But more than four minutes into “Black Sabbath,” the arrangement shifts dramatically. Tempos are increased; while still delivered in an insistent fashion, the parts played by Iommi, Ward and Butler are combined in a manner that is careening toward…something. Osbourne sings along, but he seems almost consumed by a musical undertow. After a pleading shout of “No, please, no!” he bows out, leaving the instrumentalists to run out the song with malevolent abandon. The martial lockstep of the song’s final few seconds delivers a kind of boiled-down essence of Gustav Holst, hard-rock style. “The Wizard” kicks off displaying quite different musical character. Osbourne plays a simple, repetitive figure on harmonica. When the rest of the band joins in, the song seems to be heading in a riff-laden, blues-rocking direction of the sort found on albums by Savoy Brown or Ten Years After. There’s enough for a perfectly good song in those first 30 seconds. But after a quick solo from Iommi (with Ward and Butler laying down a monotone rumble under the guitarist) and a quick repeat of the blues figure, everything changes. Iommi cranks up the distortion in a manner that suggests he has a setting marked “stun.” The already-established musical dialogue style between him (with Butler in lockstep) and an endlessly inventive Ward is built upon even more effectively here. Osbourne sings effectively, but as good as he is here, the song holds up more than well enough with only its instrumental components. Rarely has as much been done with three notes as Black Sabbath does with “The Wizard.” It’s fair to wonder if the Ramones drew some kind of inspiration from the tune. Intentionally or not, Black Sabbath’s playing on “The Wizard” shows them as kindred spirits with Detroit-based rockers the Stooges. The third track on the original North American vinyl pressing of Black Sabbath (and most subsequent CD reissues) is a medley. “Wasp” is progressive-leaning hard rock, a blues-based instrumental melody with some ambitious touches and a busy bass line. “Behind the Wall of Sleep” finds the band again using a four-to-the-beat call-and-response approach; this time the dialogue is mostly between vocalist Osbourne and Iommi on guitar. The tune begins its fade-out with Ward playing a doggedly simple drum figure. The brief “Bassically” isn’t quite what its punning title suggests; it is indeed a Geezer Butler bass guitar solo, but it’s not so basic in its execution. Butler plays through a wah-wah pedal, delivering melodic lines the sort of which are more customarily found an octave or two higher on an electric guitar. “Bassically” begins to fade out, but “N.I.B.” seems to pick up right where the last tune leaves off, with a bass figure in the same key and using a similar tone. Butler’s bass riff is the foundation of the song; when Iommi enters, initially playing the same melodic line as Butler, the traditional roles between guitar and bass are blurred. Osbourne delivers the lyrics of “N.I.B.” in character as Lucifer, arch-villain of Judeo-Christian mythology. In doing so, he would provide fodder for years of (largely misplaced) conservative religious outcry against the band. “N.I.B.” features some of the most durable melodic sequences on all of Black Sabbath, and displays more than its share of musical shade and light. As the medley winds toward its conclusion, Iommi’s double-tracked lead guitar takes the spotlight; at the very end, the group seems almost to collapse in a heap, only to rally for one last collective musical stab to close the first side of the LP. After that inventive and somewhat uncharacteristically sophisticated introduction, “Wicked World” shifts into more familiar territory, with—yet again—an arrangement that features Osbourne in back-and-forth dialogue with the band’s instrumentalists. A midsection features Iommi playing in a previously unheard jangling style. After a showy guitar solo, the song returns to its standard patterns. Taken out of the context of the Black Sabbath album, “Wicked World” is a perfectly serviceable hard-rock tune; alongside the album’s other songs, it suffers a bit in its familiar approach, saved by its inventive opening minute (and a welcome reprise at the song’s end). “Wicked World” ends with a squalling guitar note. The final 14 minutes or so of Black Sabbath are occupied by the album’s second medley. “A Bit of Finger” features Iommi fingerpicking in an acoustic playing style, albeit on a very metallic-sounding guitar. In an odd choice of musical textures, producer Bain adds the distinctive “boing” of a Jew’s harp. The minute-long song doesn’t really develop beyond the musical ideas set forth in its opening. “Sleeping Village” features some histrionic riffage that’s instrumentally reminiscent of some of Vanilla Fudge’s more dramatic moments. Moving through a number of different musical sections, it’s as close as Black Sabbath comes to progressive rock. The fast-paced sections are book-ended by more familiar down-tempo movements. “Warning” is the third section of the final medley. The group’s blues affinity is explored here, channeled through what’s developing as the trademark Black Sabbath predilection for back-and-forth interplay between vocal and instruments. On “Warning” Iommi chooses a guitar tone for his solos that’s reminiscent of Peter Green’s work with Fleetwood Mac, and Geezer Butler makes good use of fuzztone effect for his anchoring bass riffs. For his part, Osbourne lands on the flat end of many of his notes—something he would be accused of doing often in the years to come—but somehow the net effect isn’t as off-putting to the listener as one might expect; in the end it’s just another oddly endearing component of the group’s collective character, along with drop-tuned guitars and lyrics that explore humanity’s darker side. With the lyrical section of “Warning” seemingly completed, the closing track on Black Sabbath still has seven minutes to go. Much of that space is filled with tasty blues jamming. For the most part, Ward holds things together while Butler churns out a steady and melodic bass line. Iommi sinks his teeth into extended soloing, subtly shifting his style and tone multiple times. After getting some self-indulgence out of the way, the group comes back together, with Osbourne returning to reprise the final few lines of lyric. With that, marred ever-so-slightly by Ozzy’s failed attempt to sing a melody that reaches outside the bottom end of his range, Black Sabbath comes to a close. Though the original lineup would go on to release seven more albums in its initial run, the songs on Black Sabbath would endure throughout the group’s live performances. Recorded nearly a half-century after the band began (albeit without founding drummer Bill Ward), the 2017 live album The End features three songs from the band’s debut album. As captured on the group’s first album, there was something special about the original lineup of Black Sabbath. After Osbourne’s departure following the release of 1978’s Never Say Die!, no less than seven other vocalists—most notably, Ronnie James Dio—would take their turns fronting the band. In fact, Butler would be replaced by a succession of four bassists, and seven drummers took their place upon the drum throne when Bill Ward wasn’t involved. Black Sabbath’s founding foursome did reunite several times for an extended run (1997-2006) and a shorter reunion (2011-2012), both times adding keyboardists(!) to the lineup, though those activities would not yield new studio recordings beyond two tracks appended to the 1998 live album Reunion. But it will be the work of the group’s original lineup that endures; the template for that run of albums was firmly and indelibly established with Black Sabbath. 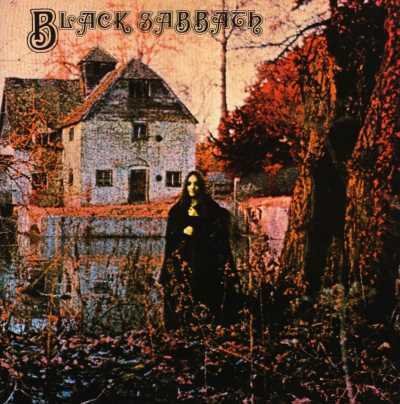 Like all of Black Sabbath’s Ozzy-era albums to follow, the band’s debut sold very well in the U.S. Black Sabbath began a five-album streak of platinum or better sales. The 1979 edition of The Rolling Stone Record Guide awarded its lowest rating, one star, to all but one of the band’s 1970s-era albums, including Black Sabbath. But despite the guide’s editors describing Sabbath’s work as “eternally foiled by…stupidity and intractability,” time would change the opinion of much of the rock-critic community. By the 1990s—more than two decades after Black Sabbath was released—the brilliance and historical importance of Black Sabbath’s album began to earn its critical due. Black Sabbath regularly appears on best-of lists covering albums of the rock era. Later editions (slightly re-titled as The Rolling Stone Album Guide) took a different view, awarding the band’s debut two stars (in 1992) and the highest rating of five stars (in 2004). And in 2017, Rolling Stone went so far as to place Black Sabbath at the #5 spot in its “100 Greatest Metal Albums of All Time” ranking.